When I got an email in my inbox last month about Denver's newest culinary adventure, I didn't know what to think. It crossed my mind that it was some sort of mistake, being that I am not on the cutting edge of anything that I do, much less where I dine, often finding myself in a dirty old taco spot instead of the newest trendy bistro. This is often the case not because I won't like the food, but rather that any trace amount of hipness I may have once had left me years ago, and as far as trends go, let's just say that I am glad people are listening to vinyl again. Nevertheless, there it was, and mistake or not, I responded. Whether from sheer embarrassment, pity or some continued misunderstanding, my email was answered and I was "confirmed" for a night of surprise dining along with 100 or so other lucky diners. Looking back, it turns out that it probably wasn't a case of mistaken delivery, because after meeting Phil Armstrong, the brainchild and ambition behind Hush, I found him to be a genuinely nice, inclusive and welcoming person. In fact he confirms why I, in general, like dining in Denver: people aren't so full of themselves. Of course there are exceptions, but the lack of pretension in the Denver dining scene, at least in my eyes, is refreshing, and must be in part a reflection of the cooks themselves. Mr. Armstrong, along with this night's featured chef, proved to add more evidence to my theory. Tonight was Hush's second event, and showcased Ian Kleinman, who was friendly, informative and enthusiastic through the entire four-hour event. Of course, Colorado diners are familiar with Chef Kleinman as the adventurous nitrogen-toting molecular innovator of O's at the Westin in Westminster. Now he has ventured out on his own with the appropriately named company, The Inventing Room; and while catering and experimenting with who-knows-what, he is also planning a retail space sometime in the near future. In the meantime, he was here at Hush, with his family of sous-chefs (literally--his dad and wife among them) to take us lucky diners on a wild ride. With him was Colt and Grey's mix-master Kevin Burke, who quietly stirred up drinks to accompany each course. Hush is hosted in Studio Como, which, in the words of Phil Armstrong is where you should come, "to redecorate your house if you have some money." And likely I would, but since that won't be in the foreseeable future, it is nice to dine on some furniture I could not afford to own; and it felt luxurious to lounge with a filo-dough shrimp, almond and mint roll on a chair straight out of the Jetson's while gulping back a whiskey caviar and cream cocktail. After a few more whiskey cream shots, and wandering around gawking at the furniture we would never see in our own home, we were summoned to our seats by our host, Phil Armstrong. He explained the impetus behind Hush, which he started as an "Intimate dining club", to showcase chefs and allow them be as creative as their culinary hearts desired. After some more kind words, we proceeded to delve into our first course, with the goal, according to Chef Kleinman, of presenting us with familiar flavors, unfamiliar textures and unique presentations via his scientific, food-altering approach. The first course was likely the best for me. It was, as Chef Kleinman promised, at once comforting and radically novel, familiar yet unique. 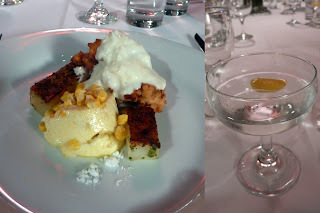 The centerpiece was a beautiful piece of buttermilk fried chicken covered in coconut gravy, served alongside a corn flan with freeze dried corn sprinkled over the top. Flanking the chicken were perfectly seasoned sous-vide potatoes with a rich blackened flavor. Powdered coconut was sprinkled off to one side. It was excellent; in texture, taste and presentation. And it was accompanied by a perfect gin martini. 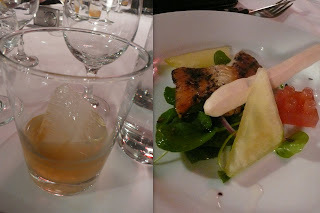 The second plate was served with a tasty honey-infused old-fashioned. Or something like that. I have never had a hard alcohol paired six-course dinner, so excuse me if some of the details are hazy. What it was paired with, however, I remember clearly as being oddly delicious and unforgettable: compressed apple, yogurt meringue sticks, apple Lego and a hibiscus smoked trout. The juicy and crispy compressed apple was wonderfully concentrated with flavor. The trout had a powerful smoky taste. The stick was somehow a crunchy and flaky, well, meringue. It all went surprisingly well together. The Lego probably didn't need to be there, but as a Lego-geek of the 1980s, I, along with the rest of our table, was all like, "Cool, a Lego," so I'm glad it was there. In between the first two courses Chef Kleinman did a table-side demo, making a nitrogen-frozen kettle-corn syrup ball, appropriately named "Space-foam". It was a light, airy and delicious palate cleanser with the added bonus that smoke came out of everyone's nose. After the second course he gathered us around a table, explaining, among other things, how nitrogen is the perfect way to make ice creams due to the rapid freezing that occurs. He then backed it up by making a divine nitrogen-frozen strawberry yuzu sorbet sprinkled with frozen, crushed olive oil. Amazing. Equally impressive was how nonchalantly he reached into bowl after bowl of bubbling nitrogen as if it couldn't burn him as easily as boiling water. I could go on and on. It was an entertaining night filled with excellent and creative food. The next course was a sous-vide succulent pork belly with a paper made of mustard, and a pastrami hash covered in a immersion-circulator poached egg. Finishing the night was a bread pudding with banana foster ice cream and a frozen caramel powder that melted all over everything to become a thickly rich and satisfying dessert. The last surprise of the night was to ingest a miracle fruit pill, which is the latest craze of foodies all over the world. I had heard about the pill, and even had a reader suggest that I try it and write a story about it, but I dismissed it as a little too ridiculous for me. The "miracle" fruit temporarily blocks the sour taste receptors of the tongue, so that everything has a sweet edge to it. We "fruit-tripped" our way down a line-up of food ranging from lemons, grapefruits, pickles, Tabasco, olives and tomatoes while sipping on a lime drink that made me pucker up in anticipation of its sourness, but that of course, didn't. Thus is the story of the miracle fruit. You should try it. It's fun. I have had the miracle fruit pill. A friend of mine did a presentation on it during our Chemistry class. It was really cool to eat all those different foods and have them taste completely different from what we expect.